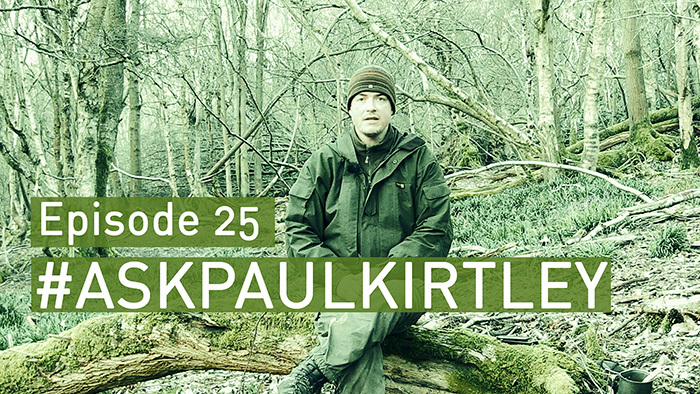 In this episode of #AskPaulKirtley I answer questions about getting started with carving utensils, exploding rocks in the campfire, dangerous gases in heated tents with wood burning stoves, what to do with worn firesteels, whether charcloth has a shelf life, reducing sleeping bag condensation and what on Earth are we up to on Snapchat? Thanks for answering my question, I really appreciate you taking the time. As it turned out, I kept at practicing with the firesteel long enough that the worn tip finally broke off on its own. I have since worn the middle 1/3 down to the same shape and will be taking your advice and replacing it soon. I agree that the ergonomics change enough where using a new one makes more sense. One more word to the wise: using a firesteel in your backyard with nice dry tinder material is quite different than using a firesteel with material you find in the woods, including feathersticks. Make sure to practice with material you get from the woods to get an idea of the difference. As ever, an interesting episode Paul. I was watching closely for more signs of beerage there but you concealed it well. Obviously a master! Thanks once again for some great content. hard experience-water borne illness three-days from possible medical help! Too weak to walk, at the time. Giardia, etc., including other “bugs” no fun in the bush.